← Why Develop a High Level of Courage? Personal courage is the way of one’s heart. It is a blending of heart and essence combined with the commitment to hold ourselves completely accountable for our actions. Applying courage consciousness, we must recognize that our spirit is the author of our fate. As your courage consciousness matures at work, you will notice huge shifts in your perspective about fear, blame and how to achieve fulfillment in your work life, validating the choice of courage consciousness over attachments that trigger life’s emotional dramas. Most people do not push past certain boundaries, particularly the artificial boundaries of corrupt or unethical workplace standards. Reflecting an absence of courage consciousness, such standards drag us down and create inroads for self-doubt. Few organizations strive to become a “virtuous organization.” A virtuous organization develops a “Courageous Leadership Charter” that practices agreed upon courageous leadership behaviors while ethics-focused organizations provide knowledge of rules and regulations. As you begin to design your own destiny and master a mix of courage action skills to overcome your personal obstacles, you amplify your level of courage consciousness and advance your career. Reflection, contemplation or meditation supports this process, allowing you to recognize and eliminate restrictive, deceptive thought patterns. Have you stepped up in your level of courage consciousness? 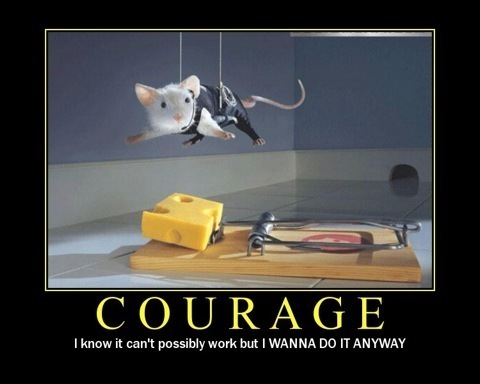 What “insurmountable” obstacle has you stuck right now? How have you learned to merge self-actualization and courage consciousness at work? What has been the response or result? This entry was posted in HR, leadership, Leadership Skills and tagged accountability, blame, confrontation, corporate social consciousness, corruption, courage, courageous leadership, deception, defensive, destiny, discomfort, ethics, fear, inertia, leadership behavior, mental chatter, obstacles, reflection, sandra ford walston, stuck, unconscious motivations. Bookmark the permalink.